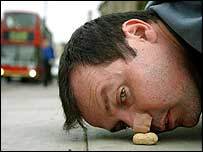 Performance artist Mark McGowan, 37, has rolled along the streets of London to promote kindness to cleaners and used his nose to push a monkey nut to Downing Street to highlight the financial plight of students. Here the mature student and fine art teacher explains why. There is a strong link between the word exhibiting and exhibitionist. A lot of people do stuff for attention but usually end up in hospital because they have some sort of mental disorder. But being an artist, you are taking part in society's culture. I grew up on the infamous North Peckham Estate in south London. But I never really had a problem with that estate or council estates in general. They are really cool places for kids growing up. I had loads of friends. I painted for about 10 years before I did a lot menial work. Then I got my degree in Fine Art. I turned to performance art because I found it a much more accessible medium to deliver what I was trying to express. One of the things being brought up in the poorer parts of London is that you get lots of people coming in doing community projects which is a complete load of rubbish, because no-one is interested in them at all. What they are interested in is football, DJ-ing and music. That's where they see their role models because the art world is so middle class so there are no role models in art. The way to engage them in art is to bring it into the street, which is what I'm doing - not by putting it in the White Cube or the National Gallery. 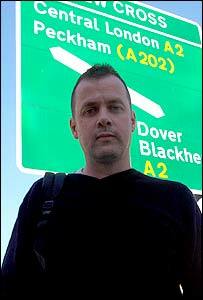 Most people from Peckham are not going to go there - there's no-one walking around the National Gallery or the White Cube with a string vest on. Most of my work is for the common man. I rolled through the streets because I was a cleaner and I was protesting about treatment of cleaners. I pushed a monkey nut to Downing Street because I wanted to say that people need grants to get an education, especially those from poorer areas. It took me two weeks and it hurt but going through Peckham, Camberwell and the Walworth Road I took it to the people - even though it was ridiculous and must have been a really funny sight. People ask me when does it stop becoming art and start to become a protest? But I say there is no distinction. It has the possibility of becoming anything and everything but it is always about bringing it back to local people. I don't want people to sit in front of the TV complaining about local issues. I want to say to them that there are other ways of expressing yourself. It would be really nice to see more activities on the streets. I don't know if there will be more of this sort of performance art on the streets - I'm not sure I've inspired people that much - but I would like to see more artists on the streets - not in the White Cube. My London is a series of features about life in the city which will be on News Online every Monday. If you have a story suggestion please send an e-mail to: londonnews@bbc.co.uk.